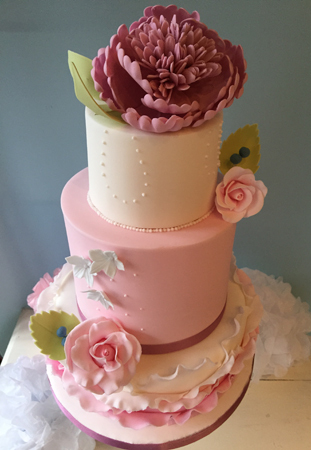 My first cake course – A Wedding Cake Masterclass! The room was smaller than I had imagined, but I knew it would be a bonus that the classes could seat a maximum of 6 students, so I felt reassured I could ask for help easily if I needed it. 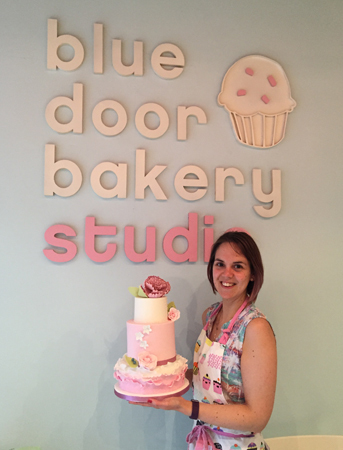 Our teacher, and business owner, Dani, was lovely and friendly, and over the two days she explained things easily and gave great demos and advice. 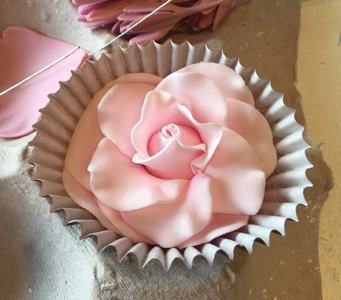 The focus of day 1 was making our sugar flowers, and we made roses, wired peonies and ranunculuses, as well as smaller flowers from cutters and moulds. We also made a few wired berries & leaves, all of which were left to dry overnight. 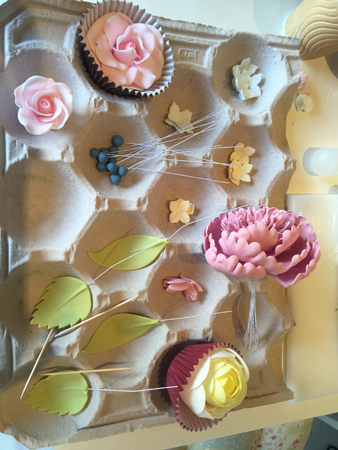 All the equipment and flower paste was provided, and I learnt a lot about techniques, as well as the right equipment to help with the job. In the picture below you can see my peony petals drying in cardboard apple trays (the type apples are delivered in to supermarkets! ), my smaller flowers drying in a foam tray, and the middle sections of my peony hanging upside down on the stand (towards the top left of the picture). 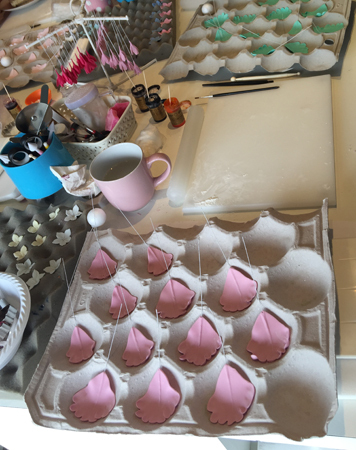 It was really great to get ‘hands-on’ – even just colouring my own fondant was not something I have attempted before (I always buy the coloured packs) but now I would feel confident to colour even large quantities of fondant or flower paste. I also picked up lots of small but helpful tips – such as using cupcake cases and cups to hold my flowers while they dried overnight. I felt a little rushed trying to keep up with the other ladies who all seemed a dab hand at this, but at the end of the day I felt happy with the tray of petals, leaves and berries I had made, and was excited the continue the course the following day. Most of us turned up eager and early for day 2, again waiting in the car park until we could go in! We assembled our peonies from all our petals, and dusted the ranunculous – and anything else we fancied!! Then came the time to cover our dummy cakes – these are polystyrene blocks that can be used for display cakes, and so all 6 of us in the class chose to make all three tiers from dummy cakes so we could keep our creations to display ☺️ I think many of the other ladies will be attending Wedding Fayres and using theirs there! 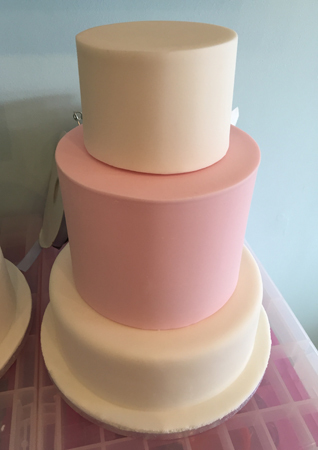 We began by covering our bottom tier & cake drum in one go, all in white fondant (a good way to save on a little fondant!). 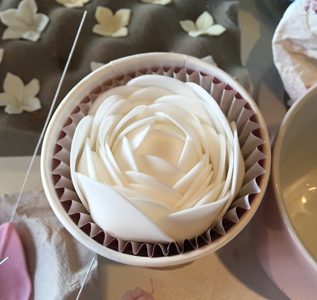 We then covered our top tier in white, practicing the technique of getting sharp corners, and after colouring fondant for our middle tier we proceeded to cover that with sharp corners too. Here you can see my attempt, which took me a while, but I think was a good first attempt. Dani then demonstrated a few methods for creating ruffles, and that was our next task, using these to cover the bottom tier. We practiced some piping too, each of us doing very different patterns, with some of the ladies showing real creativity. 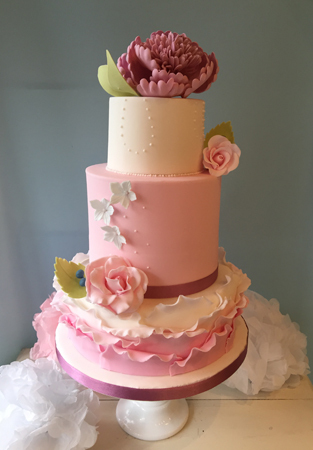 Dani commented that she loved seeing the variation in the cakes that leave the studio after this class – the colours and arrangements can vary so much, giving really varied and amazing results. Soon after came the hard task of placing all our flowers on the cake! This obviously was the last thing and I was amazed at how all the individual pieces could come together in such an effective way!! I left feeling very proud of what I had achieved, and learnt so many useful techniques, skills, tips, and even recipes. I am so glad I decided to go, and wish I could go to so many more classes there. I hope other people like this cake as much as I do! We did also work with a real cake which we could then take home to eat! I am aiming to decorate that too, so will save that for a future blog post!